Make your driveway the most talked-about spot in the neighborhood with this signature Amish mailbox in the design of a house. You can customize the colors of this mailbox to match your actual house. Each one of these Amish house mailboxes are handcrafted with nine-ply birch in the United States. With intricate details and an aluminum diamond plate roof, this mailbox is poised to bring beauty and irresistible country charm to your neighborhood for many years. 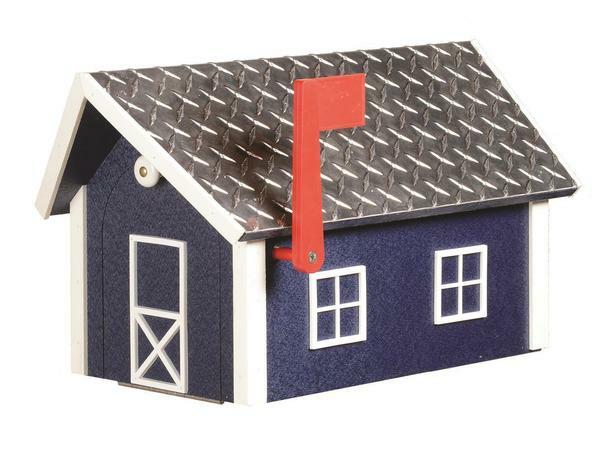 This Amish House Mailbox is available in a wide rainbow of colors - choose your ideal shade in the menu above. If you have any other questions about this beautiful mailbox, please don't hesitate to give us a call or an email or stop by our Amish furniture store to talk in person. Door Opening: 7" x 7.25"
Does not include Mailbox Post. Can be purchased separately. I did receive the mail box last Friday. It looks to be in good shape but due to recent weather I will have to wait to install it. Thanks for your assistance and great customer service. Hello...not sure if you remember me or not....I purchased the amish hutch and also a mailbox...I wanted to let you know THEY ARE BEAUTIFUL!!! I love both very very much and receive so many compliments!!! thank you so much. I will be ordering more furniture shortly....again....thank you! We have received the copper roof mailbox and it is gorgeous.